A. A toxin produced by microcystis, a type of blue-green algae, or cyanobacteria. Only certain species of blue-green algae form toxins, for reasons that aren't fully understood. Q. How dangerous is it? A. Microcystin can produce hives or blisters from direct contact with the skin. Swallowing it can cause headaches, fever, nausea, vomiting and diarrhea. Large-scale ingestion can damage the liver. Q. Why is it such a big problem in Lake Erie? A. Algae can be found in virtually any lake. But Erie is the shallowest and warmest of the Great Lakes - its average depth is 62 feet - making it the most biologically productive. It is loaded with nitrogen and phosphorus, the primary nutrients of algae. Phosphorus levels are especially important in determining how much algae form in a water body. Q. Are farms the primary source of the phosphorus that causes blue-green algae? That question leads to lots of finger-pointing. A February report by the International Joint Commission, a U.S.-Canadian organization that advises both nations on the Great Lakes, said municipal sewage plants were the primary source of Lake Erie phosphorus prior to a 1972 agreement to improve water quality. Since then, the report said, the leading culprit is runoff from farm fields, lawns, city streets and parking lots. Even deposition from the atmosphere makes a small contribution. Farm groups contend municipal sewage remains a big factor - particularly the Detroit treatment plant, which discharges into two Lake Erie tributary rivers. Studies show the Detroit River does contribute a large share of the lake's phosphorus, although concentrations are significantly higher in the Maumee River, which drains agricultural areas of northwestern Ohio and flows into Lake Erie at Toledo. Q. Does Lake Erie have a history of algae pollution? A. Some experts described Erie as virtually sterile in the 1960s, partly because of "dead zones" caused by decomposition of algae that sucked oxygen from the water, leading to repeated fish kills. Improvements in sewage treatment and limits on phosphorus in detergents boosted water quality. But the blue-green algae that generate microcystin turned up in the mid-1990s, and the problem has worsened. In summer 2011, the lake's largest bloom on record coated nearly 20 percent of Erie's surface. Q. What caused recent outbreaks, and why are they more severe than before? A. Scientists believe three factors make the present situation different. First, a greater portion of the phosphorus washing into the lake is "dissolved reactive phosphorus" - the form that stimulates algae growth the most. That may be explained by changes in agricultural practices. Farmers have made greater use of "no-till" cultivation and application of manure and chemical fertilizers directly onto the land's surface, instead of working them into the soil as before. That makes it easier for the phosphorus they contain to flow directly into creeks that feed the lake and dissolve there instead of interacting with the soil. Climate change may be playing a role by generating more severe rainstorms, which promote farm runoff and sewer overflows, says Gary Fahnenstiel, a former NOAA scientist and algae expert. It also elevates water temperatures near the lake surface and prolongs periods of separation between cold and warm water levels, promoting algae growth. Finally, invasive zebra and quagga mussels that arrived in the 1980s have gobbled up beneficial types of algae that support aquatic food chains, while rejecting harmful blue-green algae. Q. Do other Great Lakes have algae problems? A. 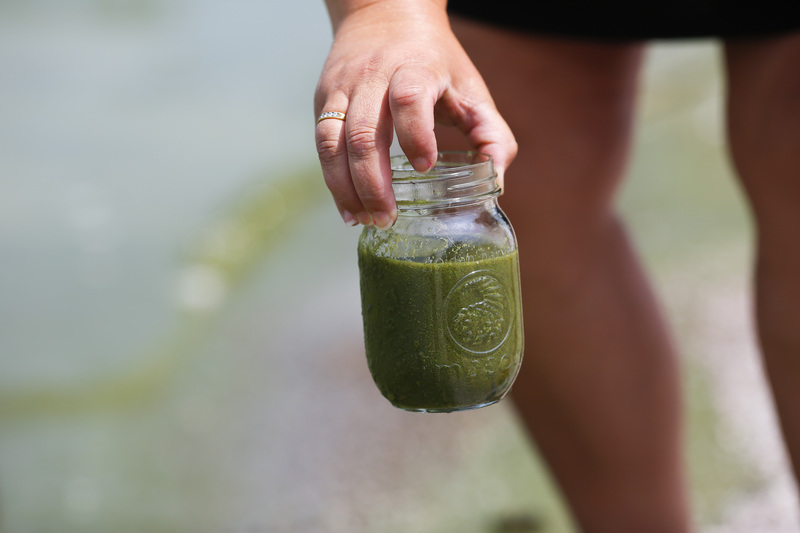 Lake Huron's Saginaw Bay and Lake Michigan's Green Bay also are plagued by various types of nuisance algae, including microcystis. But in the past decade, Lake Erie's microcystis blooms have been much more severe. Q. What can be done to prevent toxic blue-green algae growth? A. The most practical solution is to reduce phosphorus levels, said Don Scavia, a University of Michigan scientist. The commission report called for setting specific targets for reducing phosphorus runoff, including a 39 percent decline on the western end of Lake Erie. To accomplish that, the report said farmers should be required to use less phosphorus on fields, improve drainage systems and avoid fertilizer application during winter, when it is likely to remain atop frozen ground instead of sinking in. It also suggested linking farmers' willingness to adopt such practices to the availability and cost of taxpayer-subsidized crop insurance. Also encouraged were stepped-up inspections of septic systems, greater use of "green infrastructure" such as rain gardens and engineered wetlands in urban areas, and banning use of phosphorus fertilizers for lawn care in states that haven't already done so. Canada's environment ministry says it is developing options for meeting phosphorus-reduction targets.